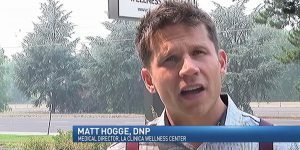 The Mail Tribune wrote a story and produced a video about how cooking classes at the La Clinica Wellness Center help patients learn healthy eating. Matt Hogge and Ana Maria Salaverry demonstrated how to make a tasty Thai curry and patients talked about how the classes help them eat well and be healthier. Matt Hogge and Jillian Robinette visited the KOBI News 5 studio to talk about cooking classes at the Wellness Center for Five on 5 that aired March 15. KTVL News 10 covered Birch Grove Health Center’s move to 910 S. Central Ave. The move gives the center more space to serve patients with substance use disorders and mental health issues. The Mail Tribune wrote a front-page story on Dec. 19 about La Clinica’s planned moves, which started with the Women’s Health Center opening in a new location. KOBI Channel 5 also aired a story on Dec. 18. KDRV Newswatch 12 also aired a story about the changes. Two back-to-school health fairs will offer drop-in access to immunizations, well-child checks, sports physicals and more on July 21 and Aug. 18. The Mail Tribune published a brief about these events.